Legionary craftsmen in 4 different workshops produced the demand of equipment, weapons and tools within the fortification. There used to be a workshop in the size of 3.200 m2 in the rear part of the camp, close to the PORTA DECUMANA. Directly adjusted to it was an additional workshop area in the size of 2.800 m2, with a large open space in the middle. We suppose blacksmith shops and foundries on this site. 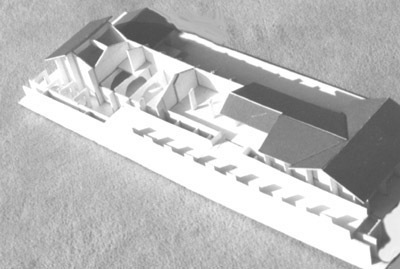 The third workshop location could have been the timber-yard of the PRAEFECTUS CASTORIUM in the centre of the fortress. The fourth building with a hook-shaped ground plan was located within the INTERVALLUM close to the PORTA PRAETORIA. Building Nr. 143, built in the type of an atrium house, is supposed to be workshop and storage for raw materials and finished goods. It seems that the large timber rafters in the roofing of the rooms, lengths of 21 m, on both sides of the columned atrium were pre-fabricated. 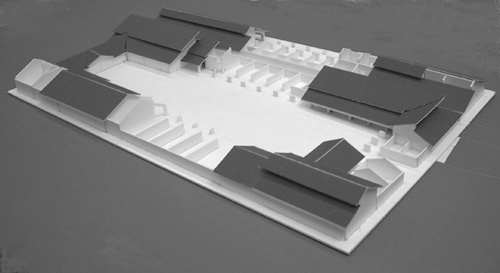 Double-storied buildings located in the entrance area are typical storage buildings, and the direct rear access to the fire-using workshops was suitable for the delivery of the required constructional parts to the working areas. The irregular ground plan in sector nr. 123 points towards many single closets that were only partly roof covered. This is the typical construction of metal working factories. Many residuals of fireplaces interspersed by iron-slag could be found in the open yard and particularly in the western wing, which became an important fact for the later interpretation of the meaning of this sector. It can be assumed that the location of blacksmiths and iron foundries was located here. The large open area points towards farriers for horse shoeing, who could have worked here. The VETERINARIUM (hospital for horses) on the opposite side, and the remises (tabernas) that belonged to the transportation services, are additional arguments for the location of the blacksmith shops on this site. It is possible that a controllable entrance and a wall at the Eastern side limited the open yard. 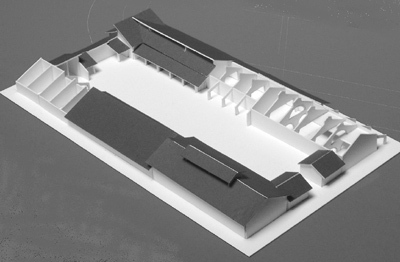 Right in the centre of the fortress, next to the PRAETORIUM, surrounded by walls, was the location of the 3.500 m² wide area of the Legionary Timber-Yard. This used to be the luxurious living area of the 3rd. highest officer, as he was the coordinator of the entire logistics organisation within the fortress. 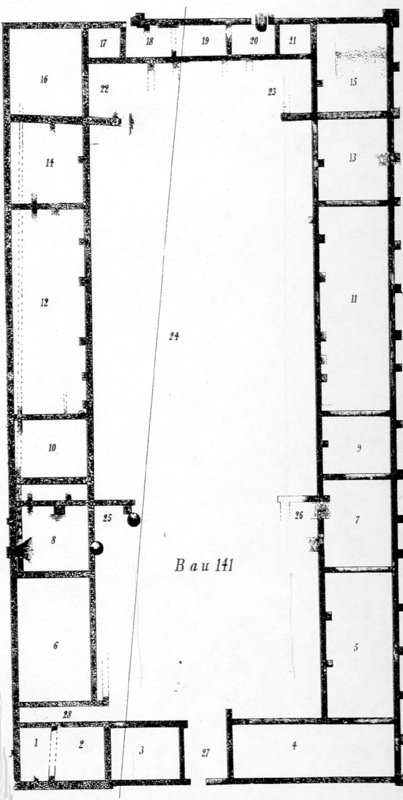 Consequently the timber-yard with its workshops and the 1.200 m² wide inner court was located very closely to his area. 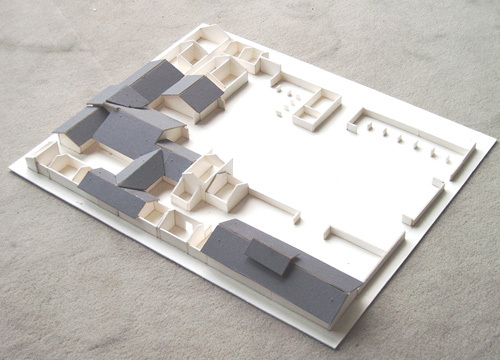 Both, the living-area and the workshop area formed an enclosed and separate yard. This can be concluded from the fact that residues of luxurious rooms were found within the Western entrance area, whereas only simple building constructions can be seen in the remaining area. The building next to the PORTA PRATORIA within the INTERVALLUM allows many interpretations. Nothing could be found inside the camp that enables definite interpretation. 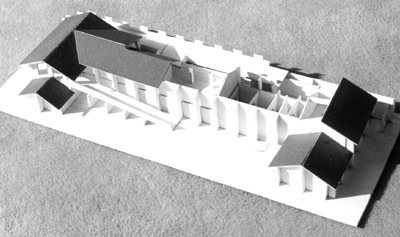 The hook-shaped ground plan is typical for a factory building. 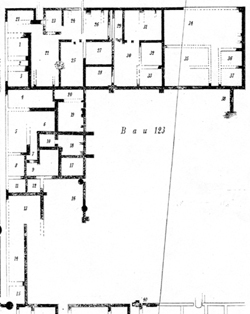 This kind of ground plan was found in different legionary fortresses. These ones however could be interpreted as workshops, according to related findings.There is certainty about one fact: it is one of the latest built large buildings in the Novaesium legionary fortress. It's construction was done in the same time, when heavy darts started to be used as remotely used arms.*17). Rampart towers got new roofs, the new defensive parapets became heavier and more chargeable, and the gates were equipped with ascending ramps. The 8 meter wide angular block of houses covered an area of 54 x 16 m. A variety of supporting-walls fundaments indicate a double-storied building that could be charged in the upper floor. Everything points towards a multiple function of this building. It seems that the upper platform was carried by stone-arches, which can be assumed from the converting of the main-part of the building and the lateral supporting walls. Heavy wooden catapults could be moved and used here. Two fundament residuals on the inner side of the defensive wall seemed to be a connection bridge to the timber-gallery *18). Heavy equipment could be stored and maintained in the basement, and we can image that a wooden ramp was used to transport the catapults to the upper platform or to the galleries.